Micropropagation protocol development for ornamental aquatic plants. Many aquatic plant species sold in the United States are collected from natural populations or imported and then propagated in nurseries. For example, the genus Cryptocoryne (Araceae) contains some of the most commercially important ornamental aquatic species imported for sale. With cryptocorynes, seed production is rare and vegetative propagation by rhizome division can be extremely slow. Unreliable supplies from the export countries combined with frequent loss of plants to poorly characterized diseases, often decrease the availability of quality plants. However, efficient in vitro propagation of vigorous plant material would alleviate both supply and quality problems while decreasing grower dependence on the importation of aquarium plants. The most popular flowering water garden plants include a variety of lotus (Nelumbo) cultivars and both tropical and hardy water lilies (Nymphaea). The greatest detriment to attaining the water garden industry's full potential is the continued reliance by growers on relatively inefficient vegetative propagation techniques of rhizome division or tuber production that, when combined with large production space requirements and the extensive time period required to produce a salable plant, all contribute to high unit costs. Development of commercially viable in vitro propagation protocols for the rapid production of water lilies would: 1) eliminate the need for additional production space requirements, 2) increase the availability of quality disease-free stock plants, and 3) allow for efficient long-term storage of cultured plant stocks to meet market demand. This technology could also be applied to the preservation of rare or endangered Nymphaea species and cultivars. To date, most Nymphaea species and hybrids established in vitro have exhibited low shoot regeneration rates. More efficient regeneration pathways, such as non-zygotic embryogenesis, are being explored. Develop procedures for effective sterilization, in vitro establishment, multiplication, rooting, and ex vitro establishment of aquarium and water garden plants. Develop in vitro procedures for mutation breeding in aquarium and water garden plants. To explore specific information concerning this project, proceed to Michael Kane's personal web page. 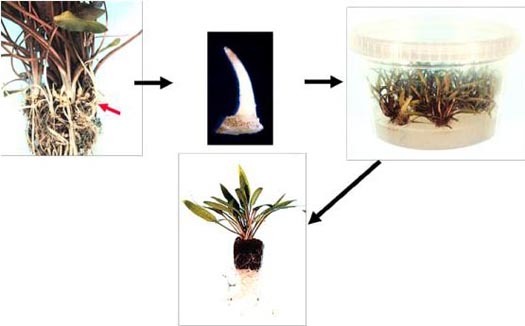 In vitro propagation of Cryptocoryne wendtii.